Foreclosures are certainly showing their faces in Brian Head. Within the last year, 70% of all residential cabins were bank foreclosures. These are frustrating times for property owners who are not heading down the foreclosure, yellow brick road. There are four new foreclosures that will be on the market soon. These are times where buyers are finding opportunities that weren’t there before making it a great time to buy. There have been only six cabins sale in the last six months, four of which were bank owned properties. The average sales price for those cabins was $241,892. Currently the average list price for all 37 active listings is $419,109. The average list price of just the 9 active foreclosure listings is $307,377. I hear this everyday – “I just want a deal” or “All the good foreclosures are sold before I get a chance to make an offer”. Well, now might be your chance. 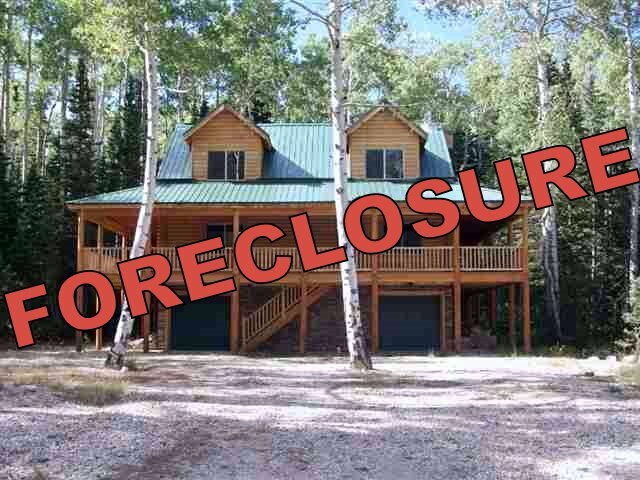 There are currently four more cabins which have been foreclosed but not yet marketed and listed by the bank. If you are interested in these properties, you can email me at bird.scott@gmail.com and I will send you the cabins’ info. If you are represented by another realtor, please call your agent and they can find them for you. I look forward to working with you and hope to see you on the mountain. This entry was posted on June 7, 2011 at 1:15 PM	and is filed under Brian Head, Brian Head Bargain, Brian Head Bargains!, Brian Head Living, Listings, real estate. Tagged: Bargain, Brian Head, deal, foreclosure, real estate. You can follow any responses to this entry through the RSS 2.0 feed. You can leave a response, or trackback from your own site.